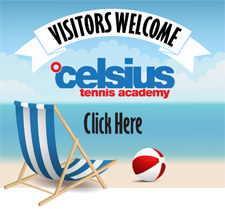 The Celsius International Tennis Program is intended for visiting high school age athletes who won’t be living with their families and would like a comprehensive program and tournament play in Florida. These players have aspirations to play the game at a high level and look forward to playing at the collegiate levels and beyond. Celsius Tennis Academy runs the tennis portion of this program and Elevation Preparatory Academy provides the academic and mentoring portion of the program. For more information click here.